Unit Pages: Summary, Equipment, Combat, Inventory, Formation, Create and Heraldry. The Summary Page contains information on the player’s Main Character, Henchmen and Units which will henceforth be described as units. This page shows the unit’s icon, the sequence at which they are listed in the summary, the unit’s name, race and gender, class, experience points, level, number of individuals in the unit, hit points, (parenthesis indicates full hit point), and the hit points of the mount or mounts, the unit’s equipment and any magical effects the unit may be experiencing. The Equipment Page contains information concerning a unit and allows the unit size and equipment to be altered. Text boxes on this page allow a player to change the sequence number that determines the order in which units are displayed on the Summary Page and the Unit Action Menu. A unit’s name may be changed by typing in a new name in the "Unit" box. Also shown are the unit’s Race, Class and Experience Points. 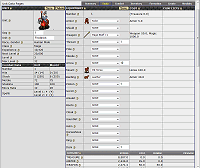 The right side of this page allows the player to change the number of troops in a unit, or equip and re-equip their units. To change the number of troops, simply change the number in the Number bow. If you wish to increase the number of troops in a unit, you must have enough Recruits available for that increase, (See City Menu), and the number cannot exceed stacking limits. To change equipment, click on the tab for each equipment category. The drop down menu will give you a list of all available weapons. (Note: you cannot equip a 30 man unit with 10 long bows and 20 medium cross-bows - you must choose a single weapon of each type to equip every member of the unit.) The page also shows the per-unit cost of each piece of equipment and potential conflicts between two pieces of equipment. (A unit cannot use shields and two-handed swords at the same time, for example.) Players will not be able to save equipment changes that involve a conflict. The Combat Page show detailed information about every aspect of the unit. This includes movement and size, purchase and maintenance costs and combat data. Buy Cost: The costs associated with equipping this unit, in terms of treasure, armor, weapon, bow, horse and magic. Maint Costs: The costs to maintain this unit and this unit’s equipment for one World Game Turn. Spell Level: The levels and numbers of spells available to this unit (character or henchman only), depending upon Class and Level. Defense, Hand, Throw, Missile and Spell show the speed, range, defensive and offensive strengths of a unit’s various armor and weapons. The equipment that factors into that data is listed at the top. The inventory page shows all items taken as spoils during battles. If an item is usable by one of the player's units it will appear in the drop down window for the item type on the Equip Page. The player can choose to send an item to another player, sell it on the open market (set the price for sale and save), split a stack or combine similar items (split and merge) or scrap the item for half value of gold and magic. The Formation Page allows the player to pre-select the formation their units will be arrayed in at the beginning of a battle. Your units will be positioned relative to the enemy in the battle - here your front facing the enemy is at the top of the area. Click on the window of the unit and then click on the position you wish that unit to be facing when a battle begins. Hint: Put your most heavily armored units (infantry) and fighters in the front and weaker (bow) units and mages behind them. Use your mounted infantry and cavalry to guard your flanks and protect your units in the rear. To hire a henchman, choose the sequence you wish the henchman to appear in on the Unit Action Menu, type in the name, and click tabs for gender and for the class of the new henchman, (or henchwoman). Be sure to SAVE before you leave the page and Equip the unit or henchman before a battle occurs! On the Heraldry page the player can choose the livery (colors) of his army and more importantly the specific alignment of his army and city. Each race has a number of factions, each with their own agenda and allies/enemies within their race. The player may choose any of the various factions within their race at any time. Changing factions mid-game can have positive or negative effects on the players status within his race, or affect his chivalry, morality and ethics.